Danger, Bob-omb! Danger! - Handle with Care is a fangame by Superdimentiobros. It was released on April 30th, 2013. Prior to its release, two demos were released, one on the main site on June 13th, 2011, and the other at NCFC 2011. It was nominated for both most overlooked and best concept at the 2011 MFGG Awards. 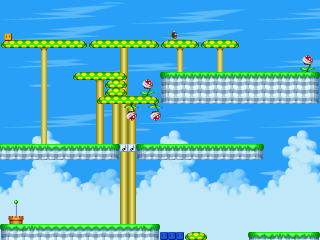 In the game, the player moves blocks with the mouse to get the Bob-omb safely to the flagpole. There are many different types of blocks & items. Danger, Bob-Omb! Danger! - Handle with Care only received two positive reviews, at which both of them gave it an 8/10. Both reviews praised the underused New Super Mario Bros. graphics and the level editor, but was criticized for a lot sounds that appeared to be missing.